I’m starting to dig deeper into the comics I got at SPX this year, and one in particular has been stuck in my craw. 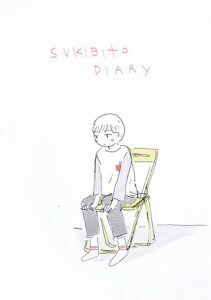 Carta Monir, a fellow critic and previous collaborator, recommended I pick up a copy of Sukibito Diary, a 120-page perfect-bound softcover book from Chu Nap. 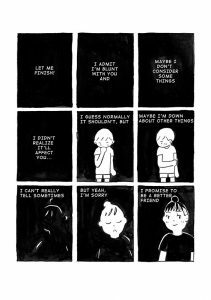 Nap is a Toronto-based cartoonist and designer; most of their recent comics work has been collaborative as a part of FANGRRLZ, an independent micropress based in Toronto and San Francisco. Sukibito Diary was originally published in 2014 and appears to be Nap’s longest published work to date. Before it was collected in a print edition, it was published in its entirety on tumblr. 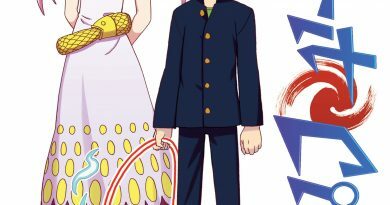 In Sukibito Diary, the main character Isla floats through life, trying to avoid the pain of growing by being disconnected from her past and present. We see a newish friendship with Anemone (shortened as Amoe for most of the book) grow and become troubled as the two people come to know each other better. Nap attempts to strike at the hazy discomfort of growth and maturation; Isla is often self-centered and lackadaisical, and isolates people that she cares about. Her lack of maturity around her long-term partner’s hiring an intern, is a great example of this. She sees the intern as taking a weight off of her, as though the emotional needs of a relationship can be filled by a person that packs boxes, files paperwork, and learns a craft. It’s her neediness, and her insults that push Amoe away in the middle of the book. She’s dealing with feelings about that relationship that are valid, but she doesn’t handle them in an adult way. It’s a self-centered worldview that continues to slowly change as the book moves forward. Sukibito Diary has a simple style that seems influenced by manga, although it skews closer to the pared down and intimate style of creators like Laura Knetzger or John Porcellino than traditional shojo. The comic is black and white with pink spot color that I found aesthetically pleasing, although your mileage may vary. Nap uses some interesting formal elements in the conversation between Isla and Amoe as they drift apart; slowly over time, Amoe fades into a completely black panel, obscured from vision. Only when Isla and Amoe come to terms and their friendship mends do we see Amoe come back into focus. There were also a few scenes where a distortion, almost like the warbly fuzz of a dying VCR tape, emphasizes Isla’s sense of disconnect and distraction from the world. 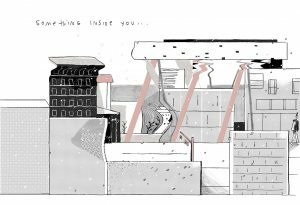 The narration of the comic, with Isla’s thoughts and feelings existing in a space above heads, evokes a melancholy that is sublimely personal, and personally wrought. My first reading of Sukibito Diary was generally positive. I liked Chu Nap’s delicate line, the formal experimentation, the strong sense of person in the characters. As a main character, Isla’s lack of growth and immaturity grated on subsequent readings. But I think there’s a specific emotional density to Sukibito Diary that I don’t normally see in comics. Being frustrated with Isla’s lack of growth is part of what makes the comic work, and seeing the way she changes to address the problems in her relationship with Amoe was very rewarding. The emotions and feelings examined in Sukibito Diary are so difficult to grasp and evaluate in any meaningful way. 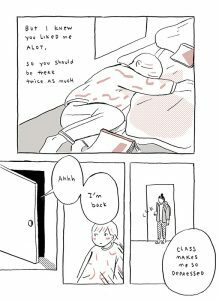 Chu Nap has made a comic that does so in a way that doesn’t feel forced. That alone is worth note. Short and sweet this week – I’m asking for your support on Patreon if that’s a thing you do. Here’s the link.